It’s the third game of the Bombers against the O’s and Robinson has been one hot hitter and second baseman. That’s undeniable. Bottom of the seventh. Cano’s strong arms showed off for the third and last out of the inning. Everyone, especially Captain Jeter, was impressed. Who wasn’t? Top of the eight. Albert Castillo replaced Matt Albers “to cool down Cano,” a commentator said. I’m not sure if it was Kay, but I’m sure Michael Kay did ask, “How hot is Cano?” Then on the second pitch to Robinson Cano, the second baseman hit his second solo home run of the night to right field. To make the night more memorable, and legendary if you want, Mariano Rivera, the last ball player in MLB allowed to wear #42, closed the game. It was a no-save situation. The Yankees lead 4-0 against the Orioles. I love it when Joe Girardi makes a night more historical. Thursday. It was Jackie Robinson Day. It was also Phil Hughes’ debut as the Yankees’ fifth starter of the season. I’ve been anticipating to watch this game on ESPN for it was my first live Yankees game, although I’m 12 hours ahead from the Bronx. Too bad I missed the first inning. Thanks to my Tita who wanted to watch something else. But thank God I made it in time to see the second inning’s actions. The first player in the box was Hideki Matsui. The first pitch was a ball, but the second pitch was driven deep to the right centre field. There were cheers from both sides of the crowd, and it was nice of the Yankees fan to still cheer for Godzilla. I saw Hughes’ disappointment, and I am impressed with how he carried himself. I am always impressed with Hughes. He’s just 23 years old but he carries an aura of a veteran, sort of Andy Pettitte aura. It was Jackie Robinson Day and the man in the box for the first at-bat of the bottom of the second was the second baseman of the Yankees, who was named after the man who broke the colour barrier. On the second pitch, Robinson Cano drove a solo homer in the right field off Scott Kazmir tying the game against the Angels. As if the solo home run was not enough, Robinson Cano did something impressive, besides his defensive skills. With Alex Rodriguez on second base, Cano hit another homer in the right field. Every fan of the Yankees, and some other fans of other Major League teams, are aware of Robinson Cano’s roots including the significance of his jersey number- 24. Of course, he couldn’t wear #42 for it was retired in the entire Major League in 1997 to honour Jackie Robinson. No one is allowed to wear 42 again, except for Mariano Rivera. 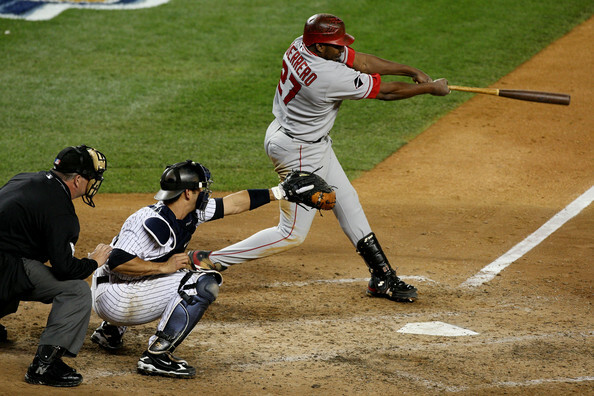 Robinson Cano was the first and last Yankee player who hit home run during the Game 3 of the Yankees vs. Angels series in the Bronx. Derek Jeter was the second and only other Yankee who drove a home run. It was in the third inning when Phil Hughes fought a battle against the Angels. His pitch count was increasing that certainly had Dave Eiland and Joe Girardi concerned. I was concerned too. It was his debut as a starter of the season. I am glad he won the battle with just one man left on base, whom he had walked. When I saw Phil Hughes’ pitch count in the fifth inning, I already knew that it might be his last inning. But I also thought that it’d be possible for him to still pitch in the sixth inning but not in the entire inning. I was right. Phil Hughes still pitched in the sixth inning but Joe Girardi had to take the ball from him after two at-bats, when Torii Hunter and Hideki Matsui, for a walk, got on base. It was obvious that the third, including the fourth inning, had a toll in his arm. More than Torii Hunter’s wheels, I was worried about Phil Hughes’ arm. I think he had a total of 108 pitches during the game. That was a gamble. When Phil Hughes returned to the dugout, I was impressed by the fans who gave him a standing ovation. It was sweet. Hughes was replaced by David Robertson, followed by Damaso Marte then Joba Chamberlain. The latter was doing good especially with his slider but something went wrong. I wouldn’t say it’s his mechanics. Joba can throw impressive pitches, but he’s not at par with veteran pitchers nor with Hughes when it comes to mental preparation and attitude, which greatly affect a pitcher’s performance in a game. With two men on base, Enter Sandman was played in the entire Stadium. Mariano Rivera came to save and close the game. 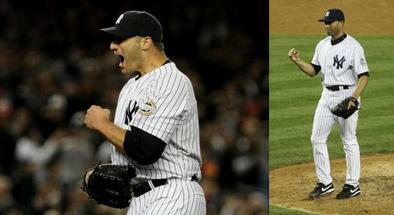 Mo only faced Bobby Abreu, who grounded out to Robinson Cano to Mark Teixeira for the final out of the game. The Yankees won the third game against the Angels, 6-2 on board. They won the series with 2-1. 34 must be a lucky number in the World Series. Game 1 winning pitcher Cliff Lee wears #34 in his Phillies uniform. AJ Burnett is also wearing #34 in his Yankees uniform. And who will forget Nolan Ryan and Rollie Fingers? AJ Burnett pitched for the Yankees in World Series Game 2 with a blast. The Yankees beat the Phillies on 3-1, tying the series on Thursday night in Yankee Stadium. The Pie-Man of the Bronx was able to keep his goal for the game. “I won’t change anything as far as my plan or my attack, just maybe not be so careless from the get go — just throwing balls over the middle to get strike one,” Burnett said. The right-handed pitcher allowed 4 hits, 2 walks and just one run in seven innings. The run was from Raul Ibañez, who hit a double, driven by Matt Stairs’ single, a ground ball to left field that was deflected by Alex Rodriguez in the second inning. If the Phillies had a lot of runs in Game 1 on Wednesday, Thursday night gave them a lot of strikes and strikeouts. Burnett struck out Raul Ibañez twice and Ryan Howard thrice. He struck out four other Phillies. Burnett’s favoured catcher was outstanding, not just in helping him with his pitches. Jose Molina, also a Puerto Rican, kept a runner from staying in the fourth inning. Jayson Werth hit a single on a full count but while Ibañez was batting, he was picked off by Molina at first base on a throw to Mark Teixeira. AJ Burnett only faced three batters in the fourth inning. The Bronx Bombers hit two solo home runs. The Yankees’ first homer in the World Series came off the previously shy bat of Mark Teixeira over the fence in the right centre field in the fourth inning. It was his first career World Series home run. The other solo homer was provided my Hideki Matsui on a fly ball in the right field in the sixth inning. It was Godzilla’s second career World Series home run. When Jorge Posada was announced to pinch hit for Jose Molina in the seventh inning, Phillies manager Charlie Manuel left the dugout to get the ball from Pedro Martinez, the Phillies starter, and summoned Park Chan-Ho to face Posada who went 0-for-7 against him. Pedro Martinez pitched for 6 innings and left the mound with 4.50 ERA. He struckout eight Yankees but allowed 6 hits and 3 runs. A.J. Burnett may opt for Jose Molina to catch for him, but he was the number one cheerleader of Jorge Posada when the veteran catcher hit a single on a line drive to centre field driving in Brett Gardner, who was pinch running for Jerry Hairston, Jr., for another run. The run was charged to Pedro Martinez. The Philadelphia Phillies were able to keep the remaining Yanks off the plate when Johnny Damon lined into a double play. Posada was out off first. They also caused a gathering of the umpires to discuss the play and call, which was questioned by Joe Girardi. The Phillies were trying to rally more runs, but the goal seemed impossible as they had to face Mariano Rivera in the eight inning. Posada stayed in the game to replace Jose Molina. The eight inning was quite a battle against The Sandman who drew the third walk for the Phillies with just one out. Shane Victorino, batting next, was able to hit a single on a ground ball to right field. The Old Guard closer was able to stay out of trouble when Chase Utley grounded into double play, Robinson Cano to shortstop Derek Jeter to Mark Teixeira. Shane Victorino was out at second base. Ryan Howard was batting first in the ninth inning, but he never had the chance to have a base hit as he was struck out on 0-3 count by Mariano Rivera. The first baseman of the Phillies was totally shut out by Burnett and Rivera in his four at-bats. After 38 pitches, Mariano Rivera struck out the eighth batter he faced on 2-2 count for the final out of the game. The Yankees are off to follow the Phillies in Citizens Bank Park for Game 3 on Saturday night. Andy Pettitte will start for the Yankees who will face Cole Hamels. was finally pushed through on Sunday night in the Bronx, New York. confidence and results that speak of his possible legend. to be a wrong move; obviously. helped the Yankees reach homeplate. Morales hit the ball back to him for the third out. his throne with 99 pitches and a 2.84 ERA. Mariano Rivera is one of those pitchers you don’t want to face when you’re in the batter’s box. work. Matthews, Jr. struckout swinging for the final out of the series. The pitch was not even a cutter. Mariano Rivera secured the World Series ticket his Old Guard buddy Andy Pettitte clutched for the Yankees. on homeplate to give way for A-Rod who was walked with bases loaded. the National League on Wednesday night in Yankee Stadium. Also posted in MLBlog and Bleacher Report.